While not in chronological order but rather geographical order the next stop for me was New Jersey. The fall colors this year were really pretty good. I may have missed it slightly North in the Adirondacks and in Virginia ( upcoming Part 3 ) but wherever I was able to shoot in the Garden State the colors were bright and crisp. 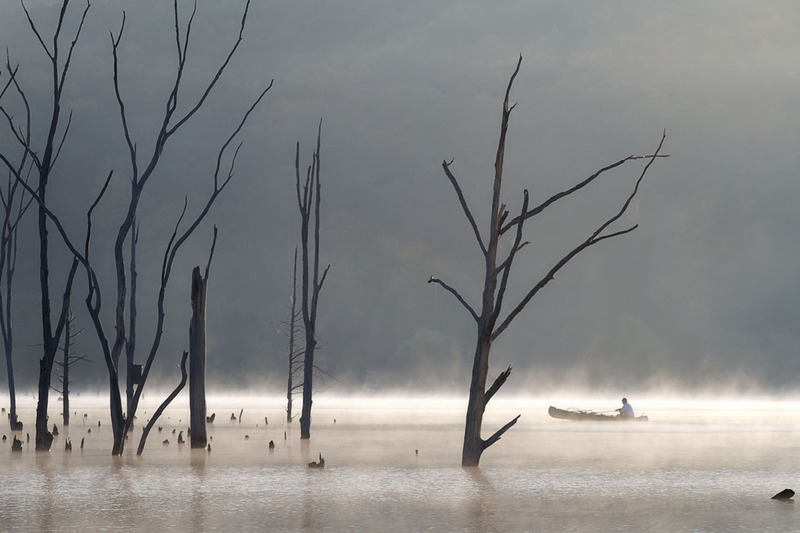 These two images were shot at Monksville Reservoir. 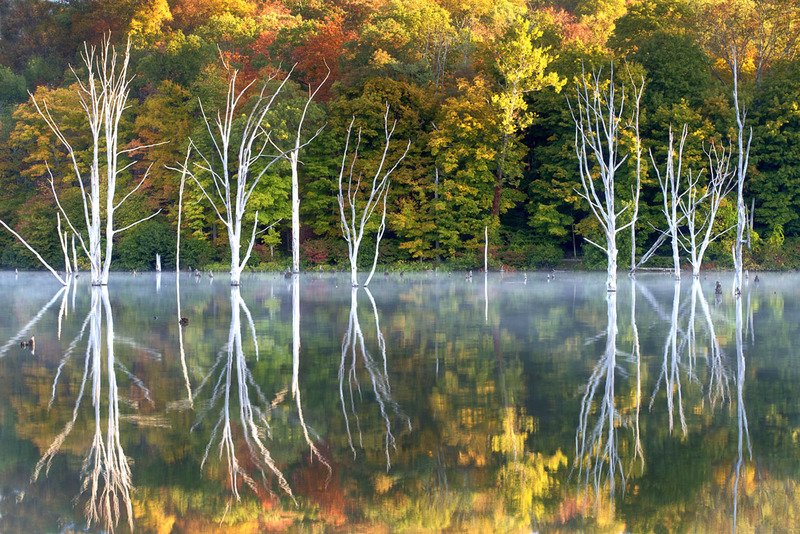 I met up with Dean Cobin that morning and we drove to Monksville Reservoir looking for some combination of fog and dead trees. Maybe on the face of it doesn’t it sound interesting but I like to photograph dead trees in water. The starkness and how they interact with themselves and the background make for interesting compositions and images. A couple of my current favorite dead trees in water spots in New Jersey are Franklin Parker Preserve and Merrill Creek Reservoir and I can now add this spot to the list. This particular morning didn’t produce any significant heavy fog but rather a light fog that quickly dissipated. For the first image we positioned ourselves directly across from a grouping of trees. Their bold white trunks and limbs became very graphic against the wall of foliage on the shore across from us. Virtually no breeze that morning kept the water calm for beautiful reflections, an added bonus. What was hard to see in the morning was how colorful the leaves were but as the fog dissipated and the sunlight began to pour across it became apparent that it was going to be a nice combination. The colors here were similar to all the areas I shot through out the state. For the second image I moved down the shore and looked at another set of trees further up the lake. As I did this I noticed how the low level fog was becoming backlit and the trees had a rim light effect. At this point I knew I had the perfect vantage point. I decided that I really wanted a heavy compression of the objects for this composition. I wanted a “flatter look” to the final shot. To achieve this, I added a 2x converter to my 70-200mm lens. I shoot with a Cannon 7d and it has a reduced chip size vs a standard 35mm sized sensor. What that effectively means is that any lens size has to be multiplied by a factor of 1.6. That makes my 70-200 a 112-320mm. Couple that with a 2x and I’m approaching a 600mm sized lens. Wildlife photographers like to use a reduced chip camera like this one to increase their lens length while still obtaining a high resolution. Once I had the composition it was just of matter of getting an exposure that I liked. I had a really strong composition that by itself would have been successful but then an unexpected treat happened. A guy in a canoe was fishing and heading straight into my image. This easily elevated the shot for me. Adding that human element gave an instant sense of scale and connection to the environment There are times that as a photographer you know you have the image while your shooting. In this case, the exposure never really changed and it was just a matter of clicking the shutter when I felt the person was in the right spot. I shoot in live view mode so I was able to see the person maneuver his canoe on the back of my LCD and clicked away. The final capture is one of my favorite images from this year. This entry was posted in Locations, Photographers, Techniques by Larry Zink. Bookmark the permalink.